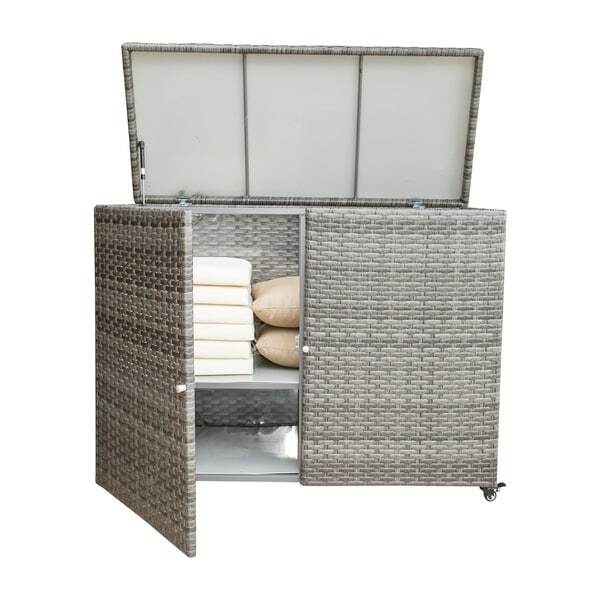 Organize your outdoor cushions, towels, or accessories with this grey Panama Jack cushion storage cart. This storage cart is made of synthetic wicker and aluminum for strength and durability. Everything looks like it does in the picture however it came damaged and seems very sturdy. It clearly had been purchased, assembled, disassembled, repackaged and sent back. Both shelves are badly scratched and one door hinge doesn’t work. For the price, I was very disappointed. It’s so heavy that it is not worth the effort to send it back, but I would definitely not purchase it again. I am disappointed in the quality control. The storage cart is water resistant, but it is not waterproof.